From January tenth through twelfth, the Niles West Thespian Troupe attended the Illinois High School Theatre Festival at the University of Illinois at Urbana-Champaign. 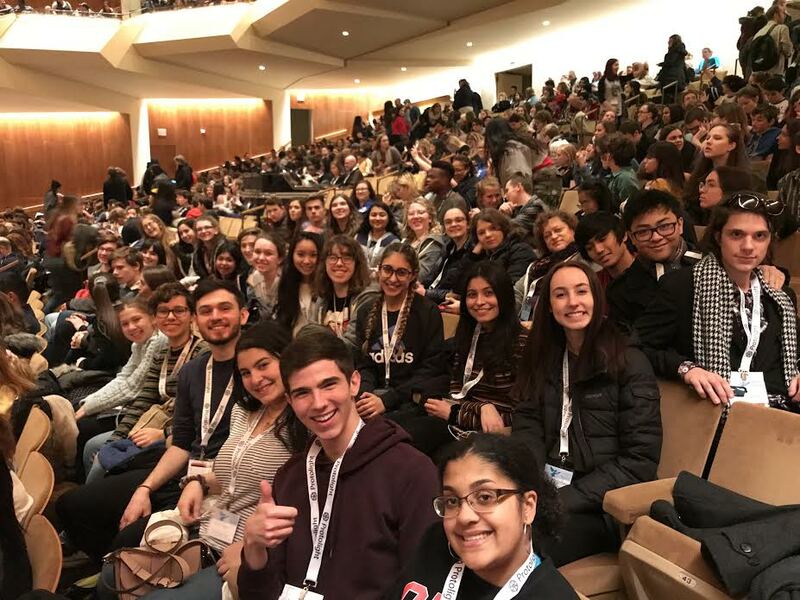 High school theatre departments from all across Illinois, including Niles West Theatre, were invited to attend and participate in the festival. At the festival, attendees watch shows that other high schools bring, participate in workshops, audition or interview for college representatives, and watch the Allstate musical. The first event that the thespians attended was the opening ceremony. As they went to sit down in the crowded concert hall, they were greeted by screaming theatre kids. Their loud behavior included throwing an imaginary ball across the room, doing the macarena, and singing songs like “Bohemian Rhapsody” and the “Phineas and Ferb” theme song. The Niles West students sat quietly as they watched the students from other schools across Illinois, as they do every year. The loud ones finally quieted down when the opening act came out: Seth Rudetsky. Rudestsky is known as a radio host for Sirius XM where he runs a few different Broadway stations. He came onto stage lip-syncing to Broadway hits, then “deconstructing” parts of songs sung by Barbra Streisand, Whitney Houston, and Aretha Franklin. Some of his constructive criticism seemed extremely disrespectful, especially when it came to the recently late singer and civil rights activist Franklin. Everything he said about her singing seemed as if he was pointing out any possible flaw. It made others question his musical knowledge. After the exhaustingly long performance by Rudetsky, the Niles West students headed back to their hotel to get some sleep before the next day. The nerves began to kick in for those who were planning to do auditions and interviews, and those students knew that they needed to get as much sleep as possible. Senior Jake Olechno interviewed for Sound Design at the Theatre Festival, where he presented his technical theatre portfolio to many Illinois colleges. His skills in Sound Design impressed some of the college representatives, earning him compliments about how his portfolio was one of the most impressive ones they have ever seen. In addition to the interviews that took place for the technical theatre students, there were also auditions for other Illinois college representatives who were looking for talented actors and singers to add to their programs. “I really got to see how fortunate we are at West to have the resources that we have,” said senior Leah Nano. Auditioning at the festival is scary enough without a support system, but Nano was able to find comfort in the staff at Niles West and how they prepared her for the audition. “The auditions we have at school for shows are just like the ones for college and being prepared makes the terrifying reality of auditioning less terrifying,” Nano said. Theatre Director Andrew Sinclair and Choir Director Matthew Hunter are two of the staff members who helped Nano, along with other auditionees, to be prepared with their respective monologues and songs. Niles West Auditorium Manager and Technical Director Mackay Dufour came along for the trip to the theatre festival as well, where he was able to accompany students to their auditions. He helped students stay calm, serving as a support system before the nerve-wracking audition. Regardless of if Niles West Theatre brings a show or not, each year they are able to see the Allstate Production, which is often a favorite for most of the group. The Allstate Production this year was In the Heights, a musical written by Lin-Manuel Miranda. High school students from across Illinois were able to audition for the cast and interview for crew head positions at last years Theatre Fest. The Niles West Thespians saw the musical right before they traveled home Saturday morning, so they were left with that as their final experience of the 2019 Illinois High School Theatre Festival.